Eco Chic is a company that sells all kinds of gift baskets including spa baskets, baby baskets, corporate gifts and lifestyle baskets. For my review, I chose the Just Peachy Gift Basket. First of all, this gift basket comes with a very nice basket that can be reused for other things. It contains peach scented organic skincare products, Rishi White Peach Blossom tea, tea infuser and freeze dried peaches from Brothers All Natural. The skincare products include a Kiss My Face peaches and cream moisturizer which smells really nice. It also comes with an Elk River peaches and cream soap and a Nourish Georgia peach soy candle. I love the peach theme! This gift basket retails for $45 and can be sent right to the recipient. I think that these gift baskets would make great gifts for anyone. They are filled with fun items that are organic. 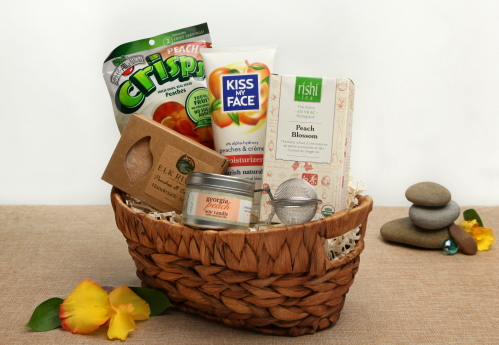 The giveaway will be for the Eco Chic Just Peachy Gift Basket ($45 value) to 1 reader. I really like the LittleTree Hugger Organic Baby Gift Basket. I love the eco products that are so prevelant. It is about time we stop putting junk on us and in us. Thank you. I am loving all of the baskets I have seen so far. Thank you for such a generous contest. Another basket I like is the Sereni-tea Organic Spa Gift Basket. I like the new products that have less chemicals.